We are big veggie lovers in our house, so we make this sandwich frequently through the summer months when vegetables are garden-fresh and abundant. It has a unique taste with the tequila-marinated vegetables, pan-fried panir (also known as paneer, an Indian cheese) and pesto aioli sauce. We like to serve it with a side of baby kale chips sprinkled with nutritional yeast and a pinch of salt. I hope you enjoy it as much as we do. Begin by making your tequila-marinade. I like to use a 2 Cup Pyrex measuring cup to make pouring easier once your marinade is ready. Add your Sciabica olive oil, pressed garlic cloves, tequila, red pepper flakes, black pepper, paprika, balsamic vinegar, lime juice, onion powder and salt. Mix well and set aside while you prep your veggies. - Cut portobello mushrooms into 1/4 inch thick lengths and set aside. Next, marinade these in two 1-gallon ziplock bags. Divide up the vegetables and marinade between the bags, seal them up and flip a couple of times until the veggies are coated with the marinade. Lay the bags flat and let the veggies marinate for a couple of hours, flipping every so often. They are best if you let them marinate overnight. Prepare your pesto aioli in a food processor. Add your mayonnaise, basil, pressed garlic, olive oil, and lemon juice. Then pulse until nice and creamy. Prepare your panir using a heavy bottom stock pot. Constantly stirring, bring 10 Cups of whole organic milk to a foaming boil. Just before the foam subsides, slowly add your lemon juice, then very slowly stir in ONE direction for 10-15 seconds, you will see the curds form and separate from the whey. Remove your pan from the heat, cover and set aside for 10 minutes. Prepare your strainer, by lining it with three layers of cheesecloth Set it in the sink, after 10 minutes, slowly pour your curds into the strainer. Gather up the cheese cloth and twist a couple of times to compress your fresh panir, then rinse it under running water for 10-20 seconds. Let it rest and cool for 20 minutes. Once your panir has cooled, slice it (like you would a loaf of bread) with a serrated knife, into 1/4 inch thick slices. Gently pan fry to a lightly crispy-golden brown. Allow to cool. Slice onion into 1/4 inch ribbons. In cast iron pan add some olive oil and gently caramelize, then set aside to cool on a large baking sheet. Grill your marinated vegetables and place on the baking sheet to cool for assembly. Heat your oven to 375 degrees on bake. Measure 4 Cups (tightly packed) of baby kale, place in a salad spinner and rinse, spinning away as much water as possible, transfer to paper towels and blot dry. Transfer to a bowl, add 2 tablespoons olive oil and toss to evenly coat, add a pinch of salt then place on two large baking sheets lined with parchment paper, spread out the kale as evenly as possible. They will have better crunch if they aren't overlapping too much on the baking sheet. Sprinkle with another pinch of salt and then liberally sprinkle with nutritional yeast. Bake in the top 1/3 of your oven for 12 to 15 minutes, or until crunchy. Kale chips have delightful flavor and crunch to them! We make them a couple of times a week at our house and they never last more than a few minutes. Once all of your veggies are cooled to the touch you can slice your whole grain bread and assemble your sandwiches for grilling. This is a pretty hefty sandwich, so I like to slice my bread into slices of no more than a 1/4 inch thick. For easy grilling I butter the outsides of my bread before assembling the sandwich. 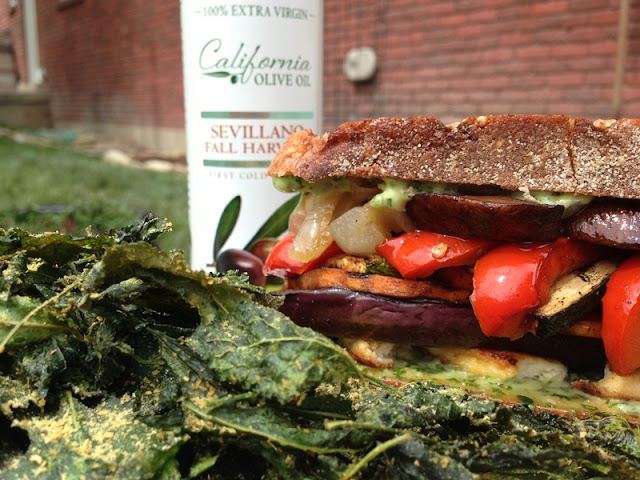 To assemble your sandwich, generously spread some pesto aioli on your bread, place a piece of pan fried panir, add a couple pieces of eggplant, zucchini, red pepper, sweet potatoes, portobello mushrooms and some caramelized onions. Spread some pesto aioli on your second piece of bread, leaving the buttered-side out for grilling, top your sandwich and grill both sides. To get nice grill marks I use the weight of a small cast iron skillet. Just wrap a piece of foil on the bottom of your skillet and set it on top of your sandwich while grilling. Serve half a sandwich with a side of kale chips and some orange and kiwi slices. *Nutritional yeast has a creamy, buttery flavor to it, it's so delicious and good for you too. It's also a nice treat on buttered popcorn.